Further to the CAS-IP submission to the DoJ on seed industry concentration, DuPont Pioneer Hi-Bred has acquired two of its distributors – Ohio-based Seed Consultants and Louisiana-based Terral Seed. This brings total distributor acquisitions for December 2010 to five. And on January 3rd the purchase of MECS, a technology company specializing in agriculture, was completed. Perhaps more disturbing, in 2010 there were several large takeovers in the fertilizer production business, and on December 20th Russian potash producer Uralkali announced that it was buying Silvinit, a smaller competitor, for $7.8 billion. According to Business Week, the new entity will control 17% of global potash output. While this is by no means an exhaustive listing of recent acquisitions, it is a reminder that the trend we wrote about a year ago, and which the DoJ planned to “investigate”, is ongoing. “In his presentation, Agriculture Secretary Tom Vilsack reminded the audience that a fair and competitive marketplace is important not only for producers, but also for consumers. John Crabtree of the Center for Rural Affairs urged the Ministry of Agriculture and the Department of Justice to stand up to industry and to stop the increasing concentration and vertical integration in farming, ranching, livestock production and meatpacking as this could only help revitalize rural America. The organizers of the workshop series were praised for their efforts to engage with farmers, producers and retailers and for opening a dialogue to better understand the issues behind competition in U.S. agriculture. The role that intellectual property, in particular the patenting of seeds and genetic material, has on competition was indeed mentioned. And it is true that last October the Department of Justice opened investigations into Monsanto’s alleged violation of anti-trust rules in the GM crop market. However, to my disappointment, the use and abuse of intellectual property rights was touched only marginally. The focus seemed more on the availability to US consumers of healthy and varied food, perhaps due to Michelle Obama’s campaign on reducing obesity in children. Based on this, I get the impression that the DoJ investigation – which started 18 months ago – is probably not going to have much impact, and that global seed production and distribution will be controlled by fewer and fewer companies. This will inevitably impact developing countries and further reduce farmer options. Given the focus of USAID and other donors on food security, perhaps it is time for these organizations to involve themselves in the discussion – before it is too late. One old hand in the field told me the other day that, on average, it takes 46 years for agricultural innovations to get from the laboratory to widespread use in the field in Africa; it’s not lack of technology that is the problem but effective means to disseminate practical solutions. Technology might be able to achieve quick fixes in health on the continent, but they might be elusive in agriculture because it entails much more complex issues of land rights and power. The Guardian coverage was prompted by the publication of a new book, The New Harvest: Agricultural Innovation in Africa, a product of the Agricultural Innovation in Africa Project. Now, he who controls the seed industry is master over life and death in the long run! That reminded me why CAS made such an investment in trying to get the DoJ to broaden the scope of their enquiry into concentration in the seed industry to include developing countries. Read the paper “Potential Impact of U.S.-Based Seed Company Competition on Access to Seed in the Developing Country Context”. One of the things holding back agriculture in developing countries is the unwillingness of farmers with small plots of land to invest in better seed and fertiliser. Only half of Kenyan farmers buy improved seed or spend money on other inputs. Many use poor-quality seed kept from previous harvests. That is understandable when drought or deluge can destroy their crop, but it has the effect of reducing yields. A new microinsurance scheme promises to help. It is smart of seed companies like Syngenta that are operating in many African countries to step out of their core business and help farmers to manage their cash flow. Seed adoption rates of 5%- 30% in most Africans countries provide for some business opportunities but innovation needs to target the other 70%-95%. To start and expand business in developing countries, multinationals must realize that their customers work under very different conditions than their customers in Iowa or Switzerland. Ensuring that farmers won’t be hit as hard by crop failure is one way to enhance seed adoption and we hope to see other ways to improve crop yields for African farmers by ensuring that they use better inputs. This should happen in cooperation with the national and international public sector as well as national private sector companies. Farmers in the West have access to a number of instruments designed to manage risk; futures trading (which guarantees a price at harvest) and crop insurance are two of the most important. And the use of trade marks – and enforcement of these – is a factor that can help to protect farmers from buying counterfeit seed which does not perform. The pilot crop insurance program was launched by the Syngenta Foundation for Sustainable Agriculture in Kenya, and enables farmers to use their cell phones (see recent post on cell phones) to register and insure seed and input purchases. Although there are several other comparable programs, insuring any link in the agricultural value chain is problematic because high and varied risks and the size of most farms (<1 ha) make it difficult to built actuarial models. ICRISAT, with the support of Irish Aid, is taking a comprehensive approach to seed sector development. My recent post on Tanzania identified poor quality foundation seed as a significant factor in the supply chain. When crops are sold as seed, it is very difficult to differentiate seed from grain. This is problematic since seed has to be of high quality and genetically “true to type” to ensure that farmers achieve good yields. To test seed purity conventionally, seed samples are drawn from seed lots and grown out so that the morphological features of the plants can be compared against a set of descriptors. But this takes time and is expensive. Alternatively, similar samples of seeds drawn from lots can be tested for purity by using a small set of molecular markers that can “genetically fingerprint” varieties. Such markers can be used directly on the seeds or on very small seedlings, and can therefore be applied at any time of the year. There is no need to grow plants to maturity to tell whether they are true to type. This method is not only quicker but also cheaper and can be done anywhere in the world where the appropriate technology exists. A farmer, breeder or seed company can send a few seeds to be analyzed for a small fee per sample and the results will be available within a few weeks, compared to a full growth season for conventional purity testing. In a project funded by Irish Aid in Malawi, ICRISAT is now testing available molecular markers to determine which are suitable to use for genetic fingerprinting of groundnut and pigeon pea . This will assist both breeders and seed regulatory agencies in ensuring that seed quality standards are maintained through maintenance breeding. This is a modest intervention – relatively inexpensive, and launched in response to observed needs “on the ground”. The outputs of this research are scaleable – the technology can easily be made available in other countries. At this time of increased need to address food security with limited funding, this is one of several models which have been incubated by the ICRISAT-Irish Aid Malawi project. I’ll be writing a post on a comparable software project in the near future. These are what I’d describe as smart investments in scaleable, need-driven interventions. As part of our ongoing market development support for ICRISAT’s seed sector mission in Africa, over the last week I met with public and private sector actors in the Tanzanian seed sector. Building a viable private sector presents a number of challenges and the situation is quite complex. This is intended only as an overview. After 30 years in power, Julius Nyere’s socialist regime collapsed in 1997, and the market-driven economy is still in the process of evolution. Under the socialists there was no private seed sector. 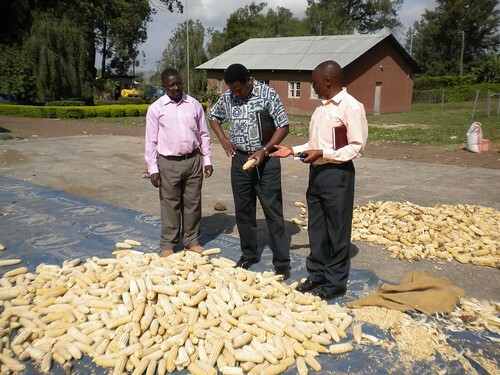 A parastatal seed company – Tanseed – had a monopoly on seed production and distribution in Tanzania. To produce, process and market sufficient high quality agricultural seeds for the local and international farming communities by using modern management and appropriate technologies to enhance food security. As a result of financial constraints, there is only limited public sector breeding in Tanzania, and no maintenance breeding; this has resulted in the loss of a number of valuable public lines. Foundation seed produced by ASA for both the public and private sector is of poor quality, which does not bode well for the future food security and economic development of Tanzania. Bob Shuma with ASA maize foundation seed; true to type on left, defective on right. 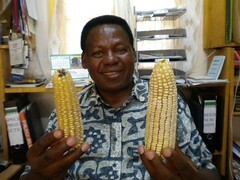 Bob Shuma, Executive Director of TASTA (Tanzanian Seed Trade Assn.) estimates that only 15% of seed planted in Tanzania is certified. With a land area of 947,000 sq. km. and four quite different farming ecologies few roads are suitable for trucking. Of the 79,000 km of roadways, less than 7,000 km are paved. This exacerbates an already fragile distribution chain for certified seed by increasing retail prices to the point at which many farmers cannot afford to buy. Conventional financing is not an option; with a banking sector that is risk averse, does not understand farming, and with interest rates in the 20%-25% range, even a medium sized and profitable regional company such as East Africa Seed finances expansion from retained earnings. When Tanzania’s seed laboratory is finally accredited to ISTA and OECD it will stimulate the availability of new varieties, new crops and new lines and export opportunities will open up; unfortunately budgetary restraints have slowed this process. With all of these constraints, what will attract local investors and entrepreneurs to invest in private sector seed activity? And how can farmers access improved technologies? These are challenges to be addressed by Tanzania, its partners and by the development community. Many thanks to Bob Shuma for his invaluable assistance on this trip, and to TASTA and Wageningen International for their support. CIA Factbook; this data is at least five years old and paved roadway has probably increased by 20%.